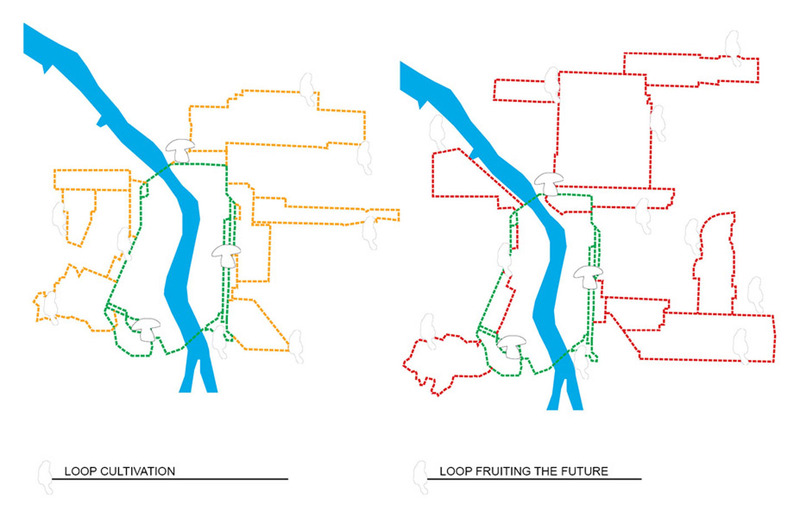 We were recently invited to submit a proposal for Portland’s Green Loop Plan. 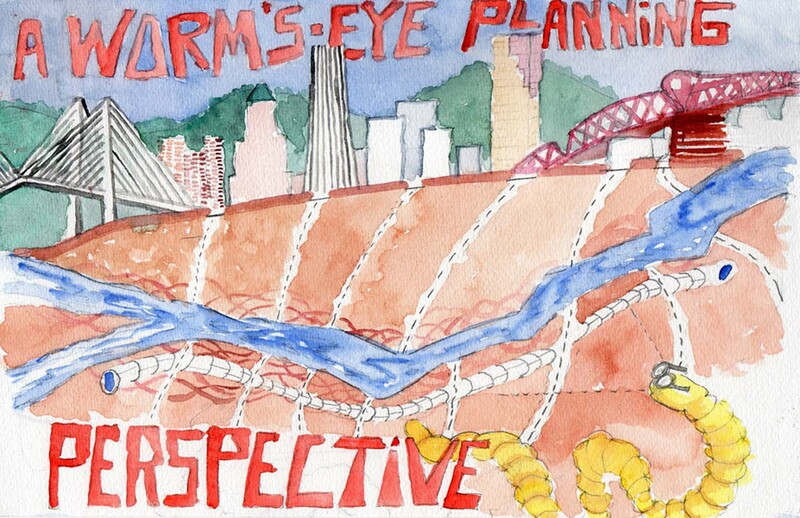 We were excited to use this proposal as an opportunity to push ourselves to think outside the box of conventional city planning as big to small, top down or a “birds eye view” approach. Our initial impulse was to reverse the previous approach and force ourselves to think from the bottom up “worms eye view” and therefore from small to big. 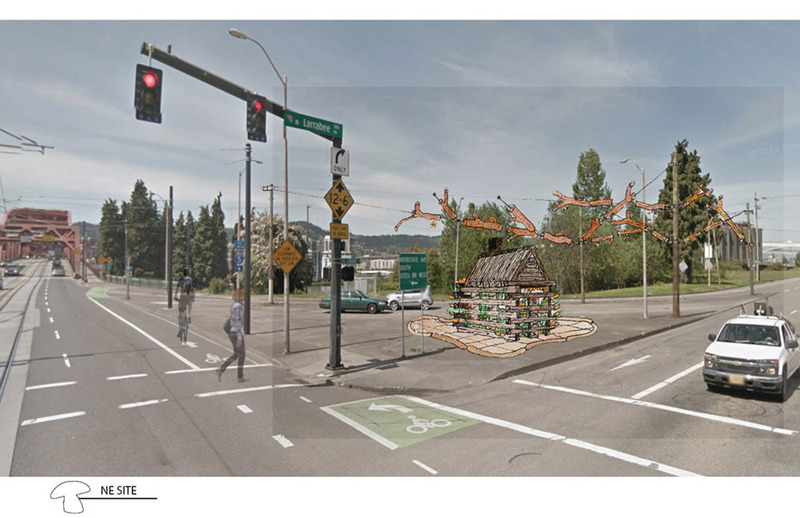 In this spirit we decided to begin by proposing a series of pop up temporary public art installations to surprise and engage people in the concept and discussion an evolving and growing “Green Loop” transportation ring around Portland’s city center. when you could be a nurse tree? Renewing a Tradition – Channel Portland’s history of urban innovation and conviviality through the creation of great public spaces. Conviviality: Late Latin convīviālis. festal, equivalent to Latin convīvi (um) feast (convīv (ere) to live together, dine together. The abundant food culture in Portland tells us that rather than from the top down, city planning in Portland could come from the ground up. 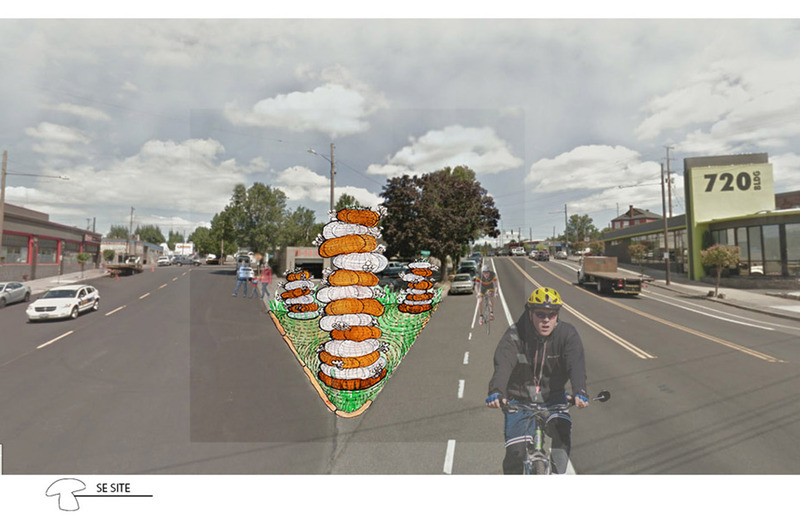 We want to resist the urge to compact, fill, and patch the shallow, friable scratch that will form Portland’s Green Loop. Bio-swales are the first step in letting Portland’s geologic underpinnings and alluvial deposits breathe with the new city built atop it. The premier recycler on the planet is not the Bureau of Planning and Sustainablity, but the proliferating biological community underneath our sidewalks and streets. City of the Future – Reflect Portland values and aim to shape the denser, livelier neighborhoods on the horizon. The utopian notion of urban vertical farming utilizes far more energy than it provides. Our proposal is more low key. 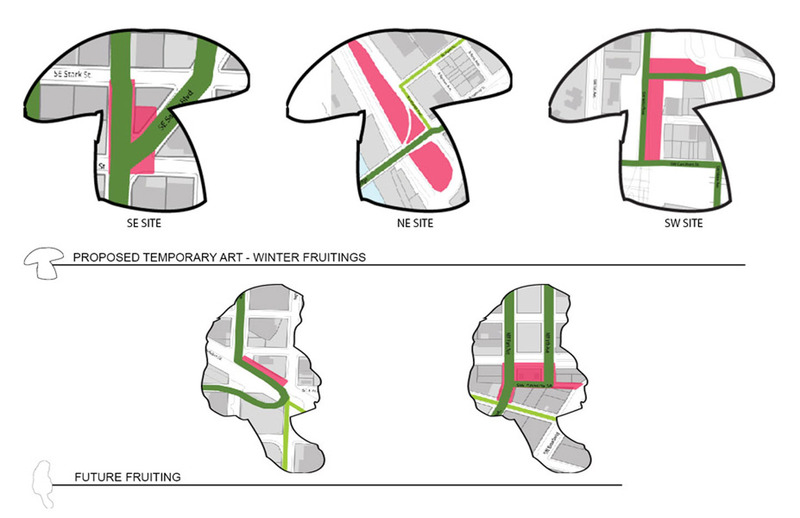 Growth and fruiting occur naturally on the horizontal plane, but rather than in broad swaths they occur in the numerous nooks and crannies of urban planning. 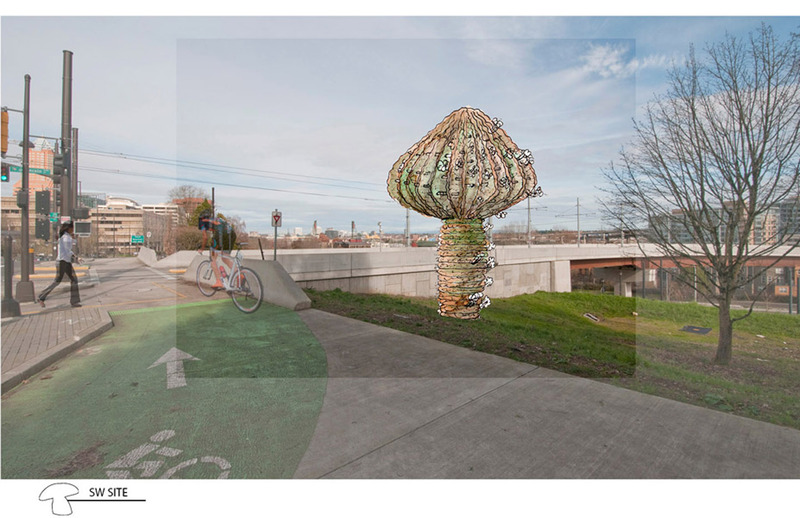 City living is a surreal juxtaposition of conditions that offers many over-looked sites for creative interventions – whether it is spore inoculation, public-art, or both. With the recent revelations of industrial toxicity in our midst, the cultivation of mycelial networks and their bio-remedial fruitings offers hope. Mycoremediation is a process of using fungi to clean the earth. This process has been used for bio-transformation of petroleum products, pesticides, and contaminated waste from the wood pulp industry. Generate Dialogue – Imagine new ways of interacting in public space. Define bold approaches to social connection. Engage existing and future users in long-term stewardship. Be fearless. The “transition places” selected for the green loop alignment are neglected, invisible spaces not for their lack of a story but more for their viscous overlay of time, ownership, site conditions, and bureaucratic oversight. 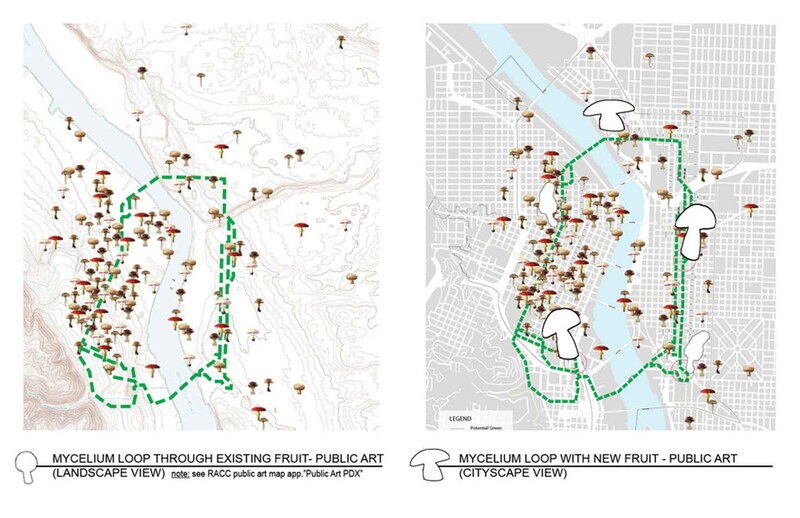 Allowing these locations to fruit reintroduces time, ownership, and site conditions as nurturing processes. The hope is for these areas of transition to become places unto themselves – to be “farmed” or tended as gateways of communities, or planting beds of stories and speculation. Design to Implement – Define achievable means for implementation, whether permanent or temporary. Tactical proposals are buildable within months. Proposals for private property should have participation of the owner. 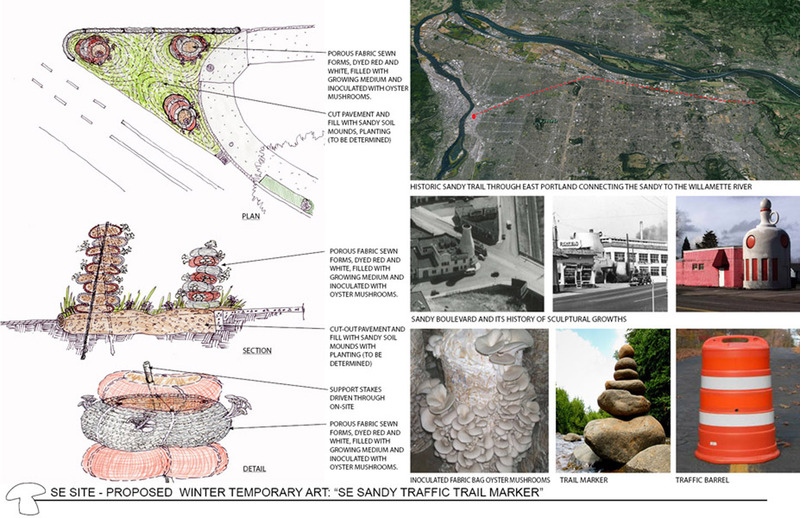 Place-making through public art work is a viable way to cultivate an on-going crop of native culture. Accustomed to working in left-over spaces artists use what is over-looked and make it capable of being experienced. A month for artist selection, two months for development and public participation, and a month for fabrication / installation is a realistic timetable for implementing site-specific public art work. 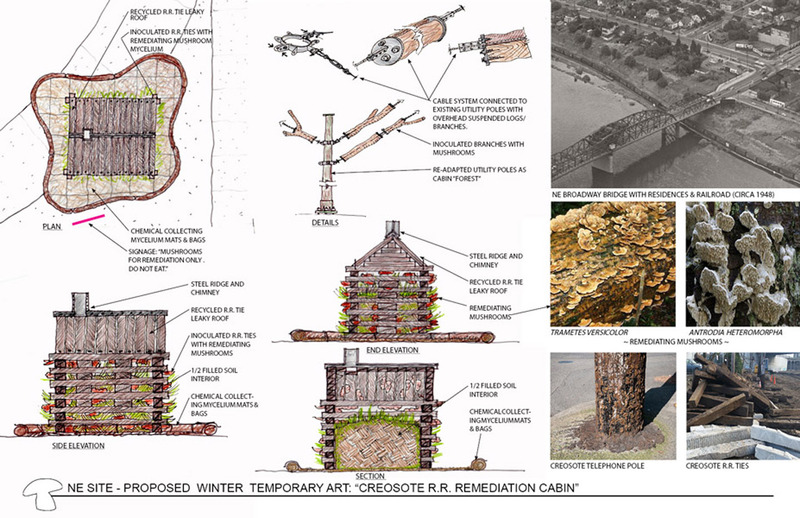 In the following images we’ve suggested three temporary public art works at three Green Loop “transition places.” We designate the sites as “spawns” or “fruitings” wherein each proposal conflates the culture of the site with a particular approach to mushroom culture – whether it is bio-remediation, farming, or building. 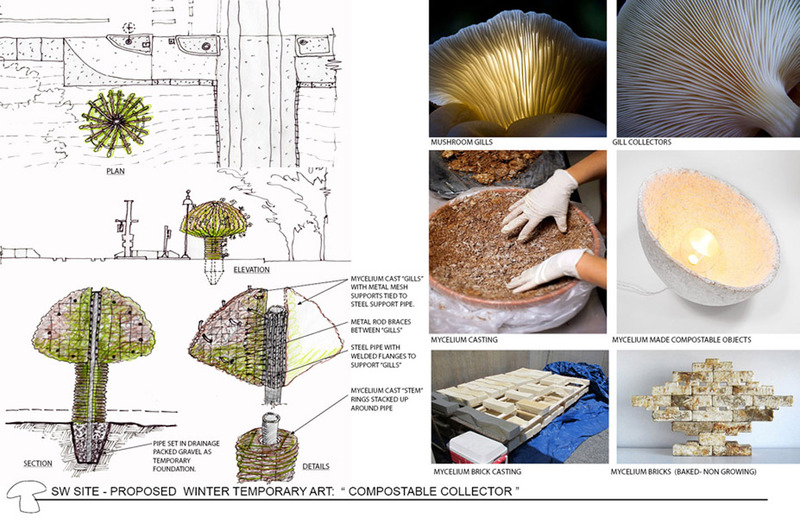 The pieces, planted in the winter, will serve as inoculations of mycelial culture into the broader Green Loop scheme.